Bet You Don’t Know What 9/22 Is! ethnic group history to diseases to food and activities. September has its share. It includes Suicide Prevention Month, Prostate Cancer Awareness Month, Childhood Obesity Awareness, Traumatic Brain Injury Awareness, Alzheimer’s Awareness, Ovarian Cancer Awareness, Backpack Awareness (this is by Occupational Therapists so I guess they’re concerned with the effects of too-heavy backpacks), Sepsis, Atrial Fibrillation, ITP (involving blood platelets) and lots more. One thing I didn’t see on this list was Blood Cancer Awareness Month. Blood cancer is not as prevalent as breast, lung or prostate cancers. I’d post some statistics, but honestly, I think it’s too late in the day for me to do that without too much thinking (my brain can only handle math between 8 and 11 AM) so I’ll post some links below. 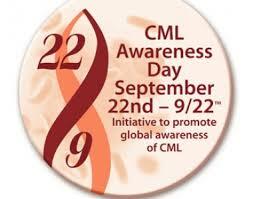 What I really want to talk about is today, 9/22 is World CML Day. This is actually pretty clever. CML is Chronic Myelogenous Leukemia. It’s of particular interest to me because I am surviving this thing. Yay! So, this is where the 9 and 22 come from. Why did this start happening to me? Don’t know. I don’t have any of the common risk factors: exposure to certain chemicals or excessive radiation, a family history or past chemotherapy. 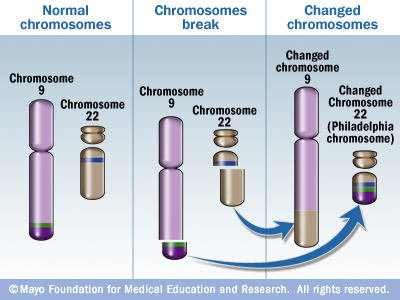 If left untreated, the uninvited Philadelphia chromosome would cause the stem cells of my blood to create many more white cells than needed. These funky white cells would take over because they live longer that regular white cells plus they don’t do their job of killing off germs. As time goes on, I would make fewer red cells to do their oxygen carrying thing on top of my body being unable to fight infection. Blood cancers are often discovered in people by accident, as was my case. I had elective surgery and my white blood cell count was found to be a little high. A few months later I was hospitalized for an unrelated infection. The heavy duty antibiotics didn’t take lower my elevated white count. I’d also had other infections in the previous months such as several UTIs of which I’d had one previous in my entire life. So this was concerning and further testing, including a bone marrow biopsy, were done, and well…here I am. For which I am grateful. CML is one of the very first cancers to have responded to targeted therapies. My treatment, Gleevec, went into us in 2001. It was considered a magic bullet. Before that, someone diagnosed with CML in the early stages, as I was, had a 3-5 year life expectancy. The five-year survival rate for CML today is about 60%. I’ve been on Gleevec for 6 years. I had an early complete response and went into remission within the first 9 months with minimal side effects. Since then, there had been no detectable glitches in my chromosomes/DNA. I take a Gleevec pill once a day. It targets the causes of the overproduction of defective white cells. There are several other similar treatments available, now, too. Each has potential long-term side effects. But hey, I now get to live long enough to see if I’ll develop them or not. It was as first thought it would be necessary to be on this treatment for life, but clinical trials are being run to see if it’s possible to go off as long as careful monitoring is done. Gleevec and drugs like it are very expensive–$90,000 a year and more. Really. What a round of normal chemo might cost, is what one year of this kind of therapy costs. The quarterly blood tests are expensive, as well. So, how does this knowledge affect you? Monitor your health. Don’t ignore unusual fatigue, infections and other changes to your good health. I’ve met people (men!) who almost died because they waited until they could barely get out of bed to see a doctor. The further the disease progresses, the more complicated and risky the treatment. It could involve stem cell transplants. Folks have died waiting for a compatible stem cell donor. This goes for people in your care, too. Don’t wait for odd symptoms to go away. Support legislation that provides for parity of cancer treatment costs, oral and self-administered vs. traditional chemotherapy and delivery. Support control of prescription costs and coverage by insurance companies. Know, that while rarer than other cancers, blood cancer can strike at any age. Some are more common to certain age groups. Know that if it hasn’t happened already, you will be affected by cancer, either you or someone you love. It’s a sucky fact, but true. When you are affected by cancer, yours or a loved one’s, get educated. Don’t panic. Deal with your emotions, but don’t dwell on the negative. Reach out for support. I’m grateful I’m still healthy and that despite job setbacks I have never had to go without my treatment. Well, 9/22/2015 is over for most of the world. Today, about 8 people found out they have CML. Tomorrow, the same and on and on until there is no such thing as cancer. This entry was posted in blog, CML and tagged 9/22, cancer, Chronic Myelogenous Leukemia, CML, gleevec, leukemia, Philadelphia chromosome, World CML Day by T A Munroe. Bookmark the permalink. Very best wishes for continuing good health. Regards Thom.